Bike Long Beach hosts Bike Saturdays every weekend; ride your bike to participating local shops and business throughout the city to get special offers and discounts. Downtown’s Just Ride LA bike shop hosts weekly no one left behind Monday evening and Saturday morning shop rides, 1626 South Hill Street. Santa Clarita concludes Bike Month with a Kids Biking and Walking Festival on Saturday, May 31st from 10 am to 2 pm at Fair Oaks Ranch Community School, 26933 Silverbell Ln in Canyon Country. 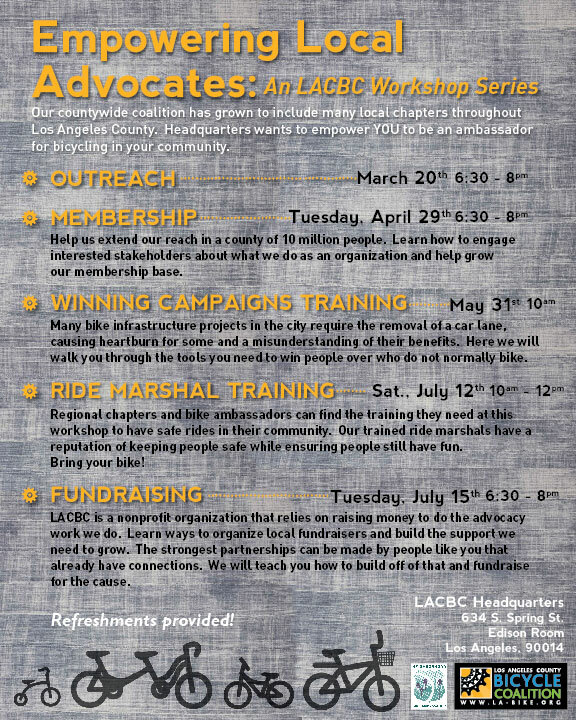 The Los Angeles County Bicycle Coalition is hosting a series of workshops aimed at empowering local advocates. The next workshop, focusing on winning campaigns, is scheduled for 10 am on Saturday, May 31st at LACBC Headquarters, 634 S. Spring Street in DTLA; see poster at left for additional dates, times and topics. Santa Monica is offering free bike and appliance repairs and repair clinics from 11 am to 3 pm on Saturday, May 31st, 1450 Ocean Ave. 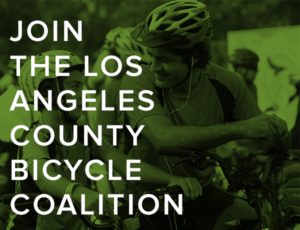 The California Bicycle Coalition, aka Calbike, will host a Los Angeles Better Bikeways House Party from 6 to 9 pm on Saturday, May 31st at RAC Design Build, 3048 N. Coolidge Ave. 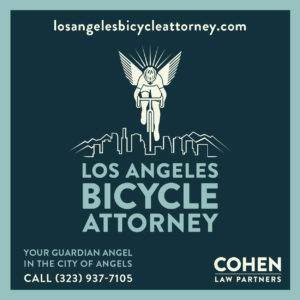 Donations will be requested to support their campaign for better bikeways throughout California. The next edition of the Los Angeles County Bicycle Coalition’s popular Sunday Funday Rides rolls on Sunday, June 1st with a fun and historical tour through Long Beach, from Snoop to Siem Reap and Everywhere in Between. Meet at 9:15 am at the Anaheim Blue Line Metro Station at Tee’s Donuts, 325 E Anaheim St in Long Beach, rolling at 9:30; free for LACBC members and a guest. Tuesday, June 3rd is election day in LA County, with vital elections for LA County Supervisor and Sheriff, both of which will influence how and where you can safely ride in the County. Read the candidates responses to the LACBC’s questionnaire before you cast your ballot — and be sure to Bike the Vote. The Los Angeles Bicycle Advisory Committee, the city’s only official voice for bicyclists, meets on the first Tuesday of every even-numbered month; the next meeting takes place at 7 pm on Tuesday, June 3rd at Pan Pacific Park, 7600 Beverly Blvd. Friday, June 6th, visit the Art of Cross Exhibit and Happy Hour Mixer as part of the Sierra Madre Art Walk, from 6 to 9 pm at CENTRICsport, 49 W. Sierra Madre Blvd. 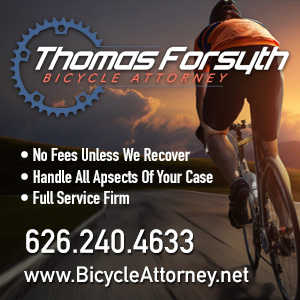 The Cycling Savvy bicycle safety course comes to Southern California for the first time Friday, June 6th through Sunday, June 8th. Sessions include Truth & Techniques of Traffic Cycling on Friday evening, Train Your Bike on Saturday and Sunday morning, and on-road training rides through Santa Ana on Saturday and Sunday afternoon; 2701 W. 5th Street in Santa Ana. Learn the basis principles of bicycle and traffic safety with CICLE’s free Traffic Basic Safety Class on Saturday, June 7th from 11 am to 1 pm, in conjunction with the Caltech BikeLab; Caltech Y Ground Floor Meeting Room, 505 S. Wilson Ave in Pasadena. Helen’s Cycles host a no-drop Men’s Group Ride on the first Saturday of each month; the next ride is scheduled for 7:45 am on Saturday, June 7th, at the Santa Monica location, 2501 Broadway. The Chatsworth Neighborhood Council invites you to ride the COLT — the 2nd annual Chatsworth Orange Line Tour — on Sunday, June 8th. Meet for the family-friendly bike rally and health walk at 9 am at the Chatsworth Train Depot Parking Lot A, 10040 Old Depot Plaza Road. The next round in the fight for a safer, saner North Figueroa takes place on Thursday, June 12th, from 6 to 9 pm with a public forum at Franklin High School, 820 North Avenue 54. supporters are asked to wear green. The Eastside’s Ovarian Psychos teams with Rio Contreras to host a three-part bike mechanics class for women and those who identify as women on consecutive Thursdays, starting June 12th from 6 to 9 pm, 1214 East 1st Street. The San Fernando Valley Bike Club offers a twice monthly Compagni Group Ride — Italian for companion — on the second and fourth Sunday of every month; the next ride takes place on Sunday, June 14th. Click here for details and other rides; lots of other great sounding rides on the list, too. Sunday, June 14th marks the first Tour de Downey bicycle ride, followed by the second annual Make Music Downey concert. 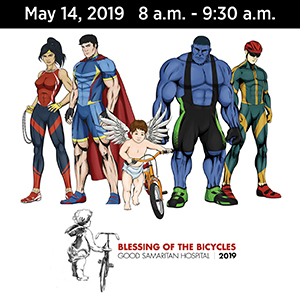 The $25, 35-mile ride to Long Beach and back departs from Downey City Hall, 11111 Brookshire Ave, at 7 am; there’s also a free six-mile Community Ride departing at 9 am. Santa Monica’s Helen’s Cycles host a no-drop Women’s Only Group Ride on the third Saturday of each month; the next ride is scheduled for 8 am on Saturday, June 21st, details TBD. LA’s most popular fundraising bike ride rolls on Sunday, June 22nd with the 14th edition of the LACBC’s Los Angeles River Ride. Ten rides of varying lengths, with starting points in Long Beach and Griffith Park, including two centuries, a 15-mile family ride and a free kid’s ride; discount prices available through May 27th. Mark your calendar for the Peace Love & Family Ride for Crohn’s and Obesity in South LA on July 5th and 6th. Great cause; more details when they become available. Bike racing returns to Downtown LA on Saturday, July 12th with Wolfpack Hustle: The Civic Center Crit; racing takes place from 1 to 8 pm on the streets surrounding LA City Hall, 200 North Spring Street. The Honor Ride Irvine rolls at 8 am on Saturday, August 2nd, starting at A Road Bike 4U, at the corner of Main St & Red Hill Ave in Irvine. The California Coast Classic Bicycle Tour rolls from San Francisco to Los Angeles September 13th through 20th to benefit the Arthritis Foundation; participation is limited to the first 300 to register. The year’s second CicLAvia takes place on Sunday, October 5th with a new variation on the classic Heart of LA route through Downtown LA, from Echo Park to East LA. Paso Robles hosts a Wine and Roses Bike Ride on Saturday, October 11th; the event is limited to the first 350 riders to sign up. Downtown Garden Grove is scheduled to go car-free on Sunday, October 12th with the city’s first open streets event. Calbike is hosting the inaugural California by Bike Surf ’N Turf Tour. The multi-stage ride travels from Santa Barbara to San Diego, starting on Halloween and ending November 5th; registration is now open. The first winter — or late fall, anyway — CicLAvia is also the first to roll through historic South LA on Sunday, December 7th, from the cultural center of the Southside in Leimert Park to the birthplace of West Coast Jazz on Central Avenue. Find bike racing schedules and other cycling events at SoCal Cycling.